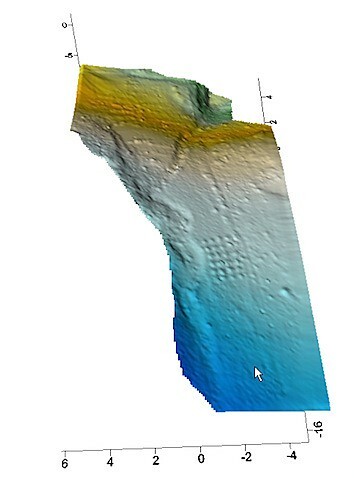 The potential of using point clouds generated from relatively uncontrolled blimp photos to establish topography for an area continues to impress me. This summer Chris Lee and I took a series of photos of the "lower town" area of Mycenae, Greece. Using these photos (and photosynth) I was able to generate this surface map (using Surfer). You'll have to check the original photosynth to see the images from this but the reconstruction of the terrain is fairly remarkable. The little grid of circles is formed from the tops of olive trees in a plot. Pretty damn cool.